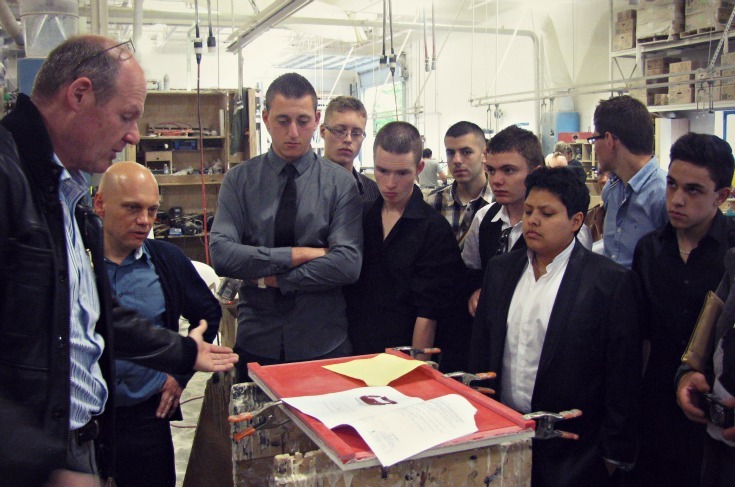 Recently Sterling Surfaces was honored to host a group of students from the Regional Technical School Building Trades and Construction, located in Montigny, Metz, France. The trip was sponsored by Thierry Delles of Crea-Diffusion, a cutting-edge Solid Surface fabrication company located in Solnge, amongst the farmlands and rolling hills of the Alsace-Lorraine region in the northeast of France. During their visit, the students were shown how Sterling Surfaces uses complex software to create 3D Solid Surface thermoform shapes. The tour continued into the shop where demonstrations on thermoforming, 4-axis CNC work, fabrication, and sanding were given. It was a pleasure to share with these attentive and interested students as Thierry explained the processes demonstrated, many of which are similar to those used at Crea Diffusion. It was fascinating to observe the respect they have for Thierry. Later, we learned from Thierry's employees that often, students graduating from Montigny are hired by Crea-Diffusion. It's a very desirable job to be employed by them, as they are known for the respect the show their employees and for giving back to the community. And they create world-class solid surface applications so the students get to be a part of an exciting profession. All at Sterling appreciated having such an outstanding and interested group of students visitinh; it was an honor for us. Much credit goes to the teachers and staff that came with them! It was a fun day here for the staff of Sterling Surfaces. Giving back to our industry is something we take pride in, and we are honored to know Thierry & Isabel Delles and everyone at Crea Diffusion.